New York City took a significant step today toward modernizing the way it allocates scarce curbside parking spaces, but it remains to be seen whether the city will embrace the full potential its new parking tech. At a press conference in the Belmont neighborhood of the Bronx this morning, Transportation Commissioner Janette Sadik-Khan and City Council Transportation Committee Chair James Vacca announced the installation of 177 parking sensors. Using magnets, the sensors can detect not only the presence of a vehicle, but the moment individual cars enter or leave spaces and the “magnetic signature” of individual vehicles. The sensors can be linked to parking meters and to enforcement officers in real-time. The city hopes to use this batch of sensors to test out a smartphone app showing drivers how many on-street spaces are open on a given block. But more transformative changes like using the sensors to rationalize parking pricing, as in San Francisco, or to beef up parking enforcement as is common in Europe, aren’t yet in the works for New York City. For the next three months, the city will just be checking to see whether the sensors can stand up to “the rigors of the streets of New York,” said Sadik-Khan, including inclement weather and street-sweeping. 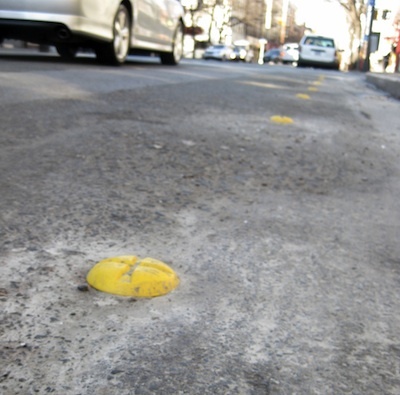 If the sensors are tough enough, the city expects to unveil its parking app sometime around April. 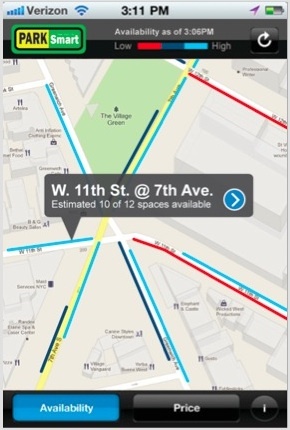 For a given stretch of spaces, the app will tell drivers whether there are fewer than two spaces available, two to three, or four or more. “We’re making it easier for drivers to park,” said Sadik-Khan. Neither the parking regulations in the area nor parking enforcement will change, she said. A mock-up of a potential design for DOT's parking app was presented at a conference last November. At that point, Transportation Commissioner Sadik-Khan promised that the sensor technology would also be used to dynamically price on-street parking. Other cities around the world use parking sensors to do far more than lead drivers to an open space, however. San Francisco’s SFPark program, for example, uses similar technology to price on-street parking in line with demand: Parking rates are raised or lowered to ensure there’s usually one space open per block. Los Angeles’s ExpressPark system, launching this spring, will add enforcement into the mix, using the sensors to guide traffic officers to the areas where they’ll be most needed. In Paris, both traffic enforcement officers and drivers receive a text message when their meter has expired, a policy that the Institute for Transportation and Development Policy identified as helping reduce the use of private automobiles there. New York has its own program, called ParkSmart, to align curbside parking prices with demand, and the city has shown interest in the full range of applications for parking sensors. When the Bloomberg administration notified companies in 2010 that the city was interested in next-generation parking tech, DOT hoped to not only use sensors for dynamic pricing and enforcing meter violations, but to crack down on placard abuse as well. And last November, Sadik-Khan told a tech conference that New York City’s smart parking technology would be used to manage the price of parking. But it’s not clear from today’s announcement whether data from the new sensors will be used to help set meter rates. The pilot project was paid for entirely by three vendors potentially interested in bidding on a larger project: Streetline, ACS, and IPsens. The sensors, which go two to a space, cost $250 each, though the city would likely get a bulk discount if it pursued a large-scale implementation. The city should not be supporting the development of an app that would only be used while driving. There is no safe way to use this app, and it should not be developed or deployed. By the way, does Vacca believe that this program should first go through a lengthy community board process? I, for one, would like at least 90 days notice before these sensors — radical changes to the street — are installed. @8f996ad67f04aec5edcfbc5070d76441:disqus youve never been in a car with a passenger? I have to agree that the benefits of more efficient parking do not seem to outweigh the costs associated with distracted driving. I’m skeptical that the sensors will survive NYC traffic. This reminds me way too much of the city’s efforts in the 1990’s to install plowable roadway reflectors on city streets – at least half of them were gone six months later. And the reflectors were level with the pavement, the photo above suggests these sensors are not. Also, does the $250 (!) cost include installation? If this might help reduce the amount of time people spend circling block after block just to find parking, it’s worth pursuing. … If the DOT can somehow find a way to avoid encouraging drivers to fiddle with their iPhones while they are behind the wheel. New cars often/mostly(?) have GPS screens built into the dashboard. Maybe there’s a way to incorporate the parking availability data into GPS on-dashboard displays. Would that be better than on handheld devices? Yeah technology! What would we do without you? You’re so good to us. To solve the problem of distracted drivers checking the app as they circle for parking, they should eliminate four parking spaces on every block, two on each side of the street. People could pull in to these empty “waiting zones,” check their phones and then wait for as long as it takes for a parking space to open up. Rather than waste $500 per parking space, why not just raise the price of street parking $0.05 per hour every week until equilibrium is reached. Instead of having magnets inform parking enforcement officers of people parking at expired meters (or in bike lanes, or double parked) just create a iPhone app where citizens (presumably on foot) can take a picture of violations and submit for consideration for ticketing. Those pictures with a clear license plate image and some context (plus location, date and time from metadata) will lead to a ticket. Areas underserved by croudsourced ticketing get increased officer patrols, the patrols displaced by the citizen inputs. @MattyCiii:disqus , that’s the killer app! You could pay a 10% commission to citizens for recording and submitting violations, creating an entire enforcement army to whom the city would have to pay neither salaries nor benefits (ticket-writing agents could be redeployed to enforce moving violations). And your average schmo with a smartphone could earn a little extra coin, spurring the local economy. Plus, I would be all over the miscreants who daily park six feet from the fire hydrant near my place. The vast majority of parking in NYC is non-metered residential parking which has no limitations on who can park there and for how long. Rather than spend money on this silly application which will have a limited effect, spend the money to fight Albany (and City Hall) to introduce permit parking city-wide restricting residential parking to legally registered and insured cars of city residents. @0b917caeb15a15ebbaa9e63014d64296:disqus So what do people do if they want to use their cars to, you know, travel into the city to visit friends or relatives who live in residential areas? And how do you deal with rentals? In other countries this information is displayed on street signs and guides the driver to quickly find the nearest spot, including paid parking. If this can reduce cruising, it has benefits for pedestrians. Likewise if it encourages people to check for parking before departing, in which case they might choose not to drive in the first place. The main thing is that the app should not be used while driving, but only while pulled over, e.g. at a fire hydrant or loading zone. Ideally, this would be enforced using GPS. I wonder: Snowplow -1 / Sensor – 0. Pay-By-Phone Coming To New York — Will Other Parking Innovations Follow?